DPS Megacity has also been judged the BEST SCHOOL in Kolkata amongst the schools set up in the last 25 years according to a survey conducted by THE TIMES OF INDIA. (TIMES OF INDIA, Date: January 16, 2014). Delhi Public school Megacity is an academic institution that follows progressive educational system. The school follows a curriculum that truly believes in developing life skill in students and making them global citizens. We are affiliated to CISCE Board (ICSE and ISC) and our students have done us very proud by securing 98.3% as the highest with an class average of 88%. We follow the latest teaching pedagogy and have received numerous awards in the field of academic excellence, sports and various other curricular activities. We at DPS Megacity believe that the secret of success of any educational institute lies in respecting pupil and that there is a brilliant child locked inside every student. To be humane above all. Mrs. Indrani Sanyal recently became the recipient of the prestigious Dronacharya Award… Best Inspiring Principal By Ananda Bazar Patrika (ABP). Mrs. Indrani Sanyal was awarded the Best Contributing Principal in English Learning by UIEO 2017. Mrs. Indrani Sanyal received an honour from ASSET in appreciation of the commitment with learning and understanding for consecutive 7 years. 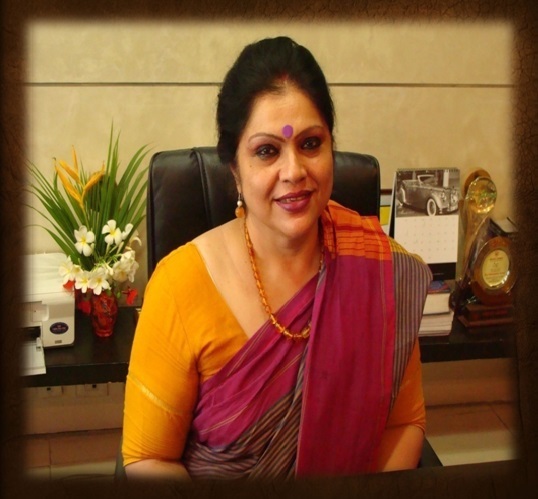 Mrs. Indrani Sanyal was appointed member of Planning Commission by Ministry of HRDC, Govt. Of India. Mrs. Indrani Sanyal is A British Council School Ambassador (BCSA). Mrs. Indrani Sanyal was recognized by The British Council for leading the Intergration Of International Learning in the curriculum. Mrs. Indrani Sanyal was awarded Aparajita : Art Of Excellence Award from FICCI. Some Recent Awards for The School. DPS Megacity once again received The Telegraph Award for the Best School for Co-Curricular Activities. We have received several Certificates of Honour and Merit from them. Delhi Public school, Megacity has been awarded with The BEST PERFORMING SCHOOL at the UNIFIED INTERNATIONAL ENGLISH OLYMPIAD(UIEO)for the last Four Years. Delhi Public school, Megacity has been Awarded with The BEST PERFORMING SCHOOL at NATIONAL SCIENCE TALENT SEARCH EXAMINATION. DPS Megacity has been awarded the Star School of the Year 2016-17 (Eastern Region) by Help Age India for their voluntary efforts in the upliftment of the less privileged senior citizens of our community. Delhi Public school, Megacity has been Awarded with Best School Award For Hindi Literary Activities From Prabhat Khabar. Authored a series Of text books for ISC, ICSE, CBSE, West Bengal Board and Graduation Level. He already wrote 9 different Economics books . Honoured with Certificate of Appreciation from Rotary District 3291 for her efforts to sensitize students towards the underprivileged in our society. Honoured with Certificate of Appreciation from NSTSE for Best Contribution to Maths & Science Education. The Best Teacher in International Sports Knowledge Olympiad in West Bengal & Andaman Region. In recognition of Special Service to THE INTERNATIONAL AWARD FOR YOUNG PEOPLE as an Award Leader. Awarded Senior fellowship in Painting by The Ministry of Culture, Govt. Of India. She researched on “Spread of Lung Cancer in Children and Youth” . Her research work has been accepted by the R&D wing of a top medical organization.